What Is Fermenting In Your Drains Might Ruin Your Wine or Beer Production - Jay R. Smith MFG Co. 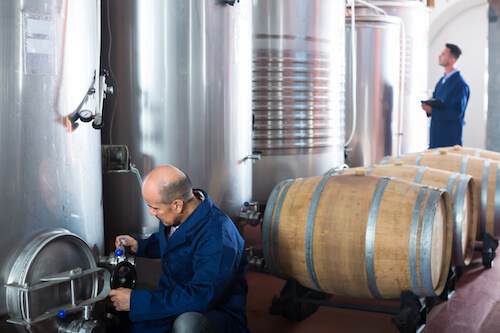 Choose the wrong floor drain for your winery, distillery or creamery, and it could have an adverse impact on your product. Choose the right drain, and it will have no impact at all, which is what you want. The only elements that should be included in your craft are the ones you control—your ingredients, your equipment, and your process. The problem is, while most makers of all things fermentedcarefully consider those three things, they put the decisions of their plumbing infrastructure into the hands of their plumbing contractor. It makes sense because, just like you are an expert in the product you produce, they are the experts in plumbing. However, some applications are not like others, and wine, beer, andcheese making is very much a unique situation. When plumbers choose a floor drain for industrial applications, they will typically opt for drains made from cast iron. It’s usually an excellent choice because cast iron will stand up to just about anything you can throw at it, and it will last for generations. While that’s great for most situations, your situationis not most situations. The last thing you want when you’re making a fermented productis to introduce rogue bacteria into your environment. Take a look inside a floor drain. It’s not a pretty site, is it? Imagine if you were to swab the inside of that drain and place a sample under a microscope. Did that make you cringe a bit? What you want is a floor drain that can standup to heavy-duty use, and one that promotes cleanliness. Stainless steel is then the obvious choice, but you already know this. You probably use stainless steel equipment in your operationsfor this very reason. You get stainless steel when you add chromium to iron. Iron brings the strength, and the chromium protects the iron from corrosion. But how does that apply to your floor drains? A stainless steel floor drain is one that can stand up to heavy equipment rolling over it, and one that can handle caustics being flushed through it. Stainless steel is a lot easier to keep clean than iron, and that is important when you’re making a food or beverage product. Not only do you have regulationsas a food and beverage manufacturer, but you also are concerned with the purity of your product. A drain that is going to corrode easily means a drain that has little nooks and crannies that bacteria can make its home in. But, believe it or not, some stainless steel drains have nooks and crannies as well. Smith drains are the best for keeping bacteria out, not only because of what they are made from but how they are made. Smith Best In Class drains do not have 90-degree angles where the sides of the drains meet with the bottom. We manufacture our drains by stamping the metal into its shape. That process creates a smooth, slightly curved edge, that is easy to keep free of sludge. When you don’t have all that dirt and grime building up in your drains, rogue bacteria and yeast have a harder time getting into your environment. Smith Best In Class drains are NSF certified. While a stainless steel drain is more expensive than a simple cast iron drain, it pays off in the longrun. It is more cost-effective because it requires less maintenance and has a longer service life than other materials. Stainless steel is also fully recyclable and has a high scrap value on decommissioning. Why is that important if it lasts so long? One day you might want to renovate your facility. If your stainless steel drains no longer fit into your new plan, you can recycle them instead of just throwing them away. While we have a whole array of drains suitable for an operation like your’sin stock, we can also do custom work. Whatever size you need, and whatever flow rate you have to accommodate, we can come up with the right solution. So, before you turn over the selection of floor drains to your plumber, have a talk with them about the importance of cleanliness in your facility. For more information on Smith’s Best In Class stainless steel drains, visit our website, or contact us to discuss any questions you might have.